Alaska's Augustine Volcano located in Cook Inlet, about 180 miles southwest of Anchorage, erupted with two explosions at the summit of the volcano on Wednesday morning. The eruptions, which are likely just a warm-up of bigger eruptions to come, produced an ash plume that reached about 30,000 feet above sea level. The ash plume detached from the volcanic vent, and winds were reported to be blowing the ash away from populated areas Wednesday, but this status can change at any time say officials. 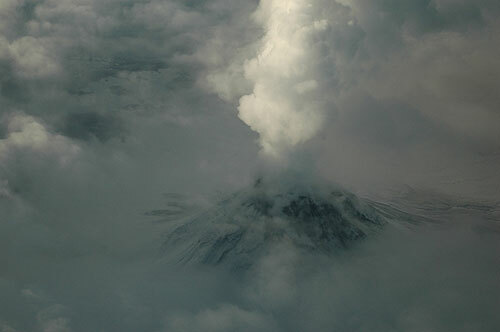 A steam plume rising from Augustine's summit, and an avalanche down the flank of the volcano are visible in this image from an observation overflight taken January 11, 2006. Image courtesy of Alaska Volcano Observatory and the U.S. Geological Survey. "Augustine Volcano is one of the best instrumented volcanoes in Alaska," said USGS Volcano Hazards Program Coordinator Dr. James Quick. "As a result, our scientists were able to detect unrest and correctly forecast the likely behavior of the volcano before it erupted." The U.S. Geological Survey (USGS) is monitoring the eruptions of the volcano that began Wednesday at approximately 4:44 a.m. Alaska Standard Time. USGS expects this eruption may be similar to Augustine's eruptions in 1976 and 1986 when the volcanic ash was spread throughout and perhaps beyond Cook Inlet. 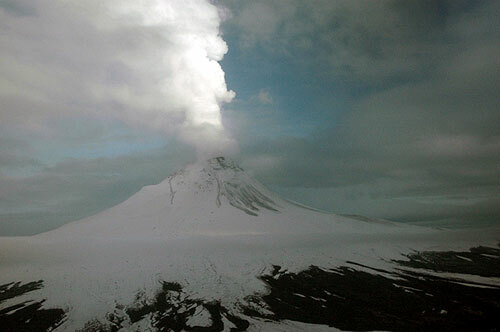 Since spring 2005, the Alaska Volcano Observatory (AVO) detected increasing unrest at Augustine Volcano. Rates of earthquake occurrence increased slowly from an average rate of one to two per day in early May, to three to four per day in October, and up to 15 per day in mid-December. Concurrent with this increase, USGS detected a small uplift of the volcano using Global Positioning Systems (GPS) instruments permanently installed on the mountain. In early and mid December, a number of small steam explosions were recorded by seismic instruments on the volcano. this image from an observation overflight taken January 11, 2006. Views of the summit following these explosions revealed new steaming cracks and localized deposits of debris. In addition, airborne gas measurements and thermal imaging measurements showed an increase in the output of volcanic gas and heat at the summit of the volcano. The highest temperature recorded, on January 4th, was 390 C (750 F). Alaska Volcano Observatory (AVO) reported they interpreted these changes as a sign that new magma was accumulating beneath the volcano's summit. In response to the activity on January 4th, Alaska Volcano Observatory (AVO) deployed additional seismometers, GPS receivers, an infrasound sensor, and time lapse cameras on the flanks of the volcano, and established a web-based camera system. Further deployment of additional monitoring equipment is ongoing and USGS will continue to monitor the Augustine's activity closely. With the eruptions early Wednesday morning, the alert level was classified at red, the highest level of concern. For up-to-date information on the status of Alaska's volcanoes, call 907-786-7478.